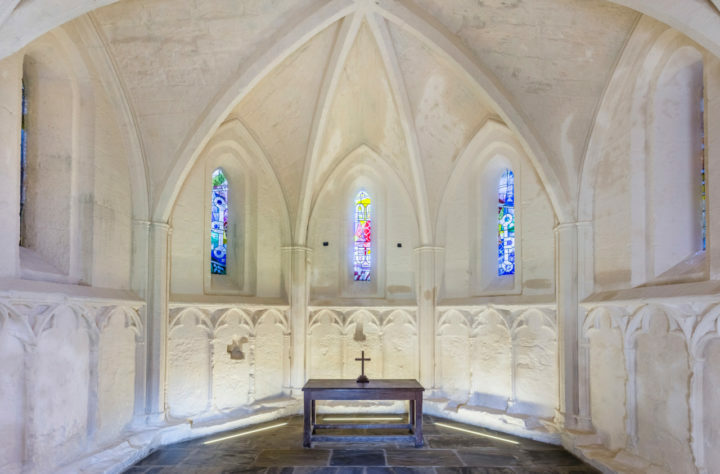 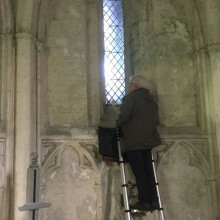 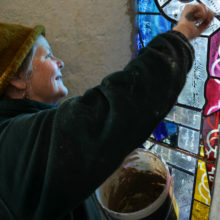 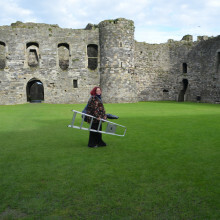 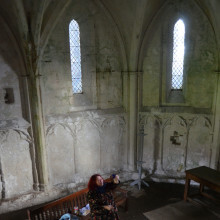 Rachel Phillips and I (working as the Creative Partnership, Studio Melyn) have just installed 5 windows in The Chapel Royal, Beaumaris Castle, a 13th Century castle on Anglesey in North Wales. 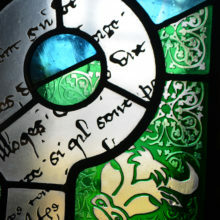 This work was a commission from Cadw. 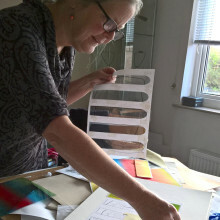 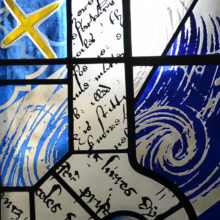 The inspiration for this proposal came from a number of sources including our research and visits to the castle and surrounding landscape; the experience of seeing a range of mediaeval stained glass, buildings and artefacts in North Wales; working on a similar interpretive stained glass project for the Royal Chapel at Conwy Castle and the growth in our interest, experience and approach to this type of project. 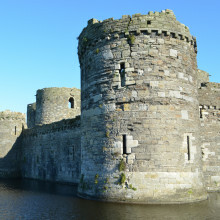 We were both struck by the scientific and engineering-led design sophistication of the castle so neatly summed up in the quote above and wanted the windows to reference strong visual motifs such as the geometry and symmetry of the castle design, which is said to have been influenced by Islamic design experienced during the Crusades. 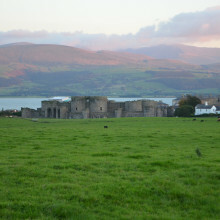 Our work embraces the language of glass in both historic and contemporary ways to reflect and represent castle’s identity as an exemplar of design excellence and cutting-edge technology of its time; a place of compelling beauty and site of successive displacement and dominance, activity and fallowness, re-discovery and use. 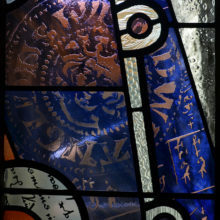 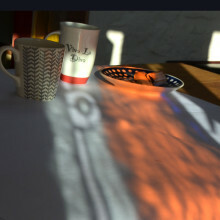 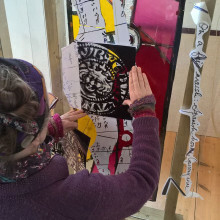 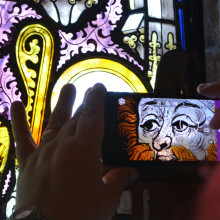 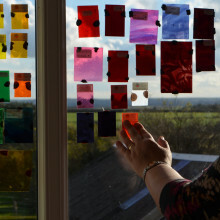 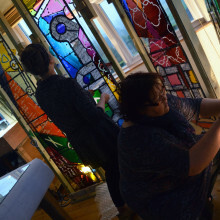 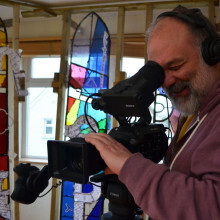 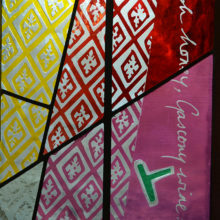 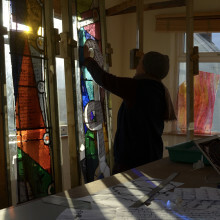 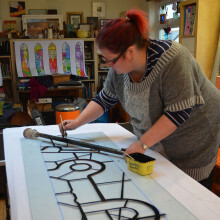 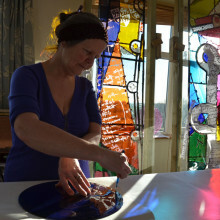 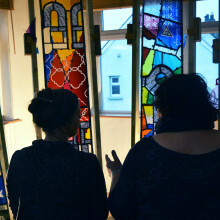 It draws inspiration from the forms and motifs of mediaeval glass in conjunction with contemporary glass approaches and techniques in order to reference the particular history and legacy of Edward 1st in Wales. 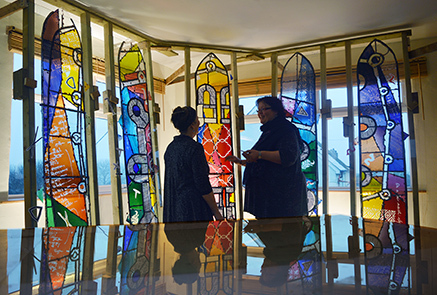 We used the plan of the castle, large in scale and centralized within the window layout, as an underlying structure for the windows into which areas of colour and detail was placed. 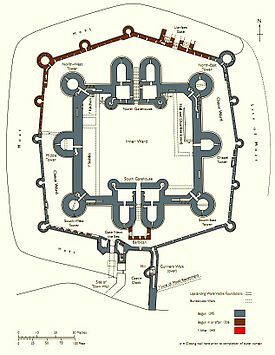 The patterns and colours reference medieval manuscripts, musical notation, coinage, heraldry and the marks of the masons who built the castle. 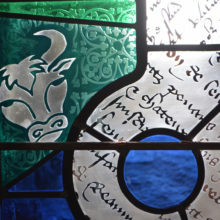 We chose to work with colours that evoke both heraldic and medieval colourscapes; blue, red and yellow. 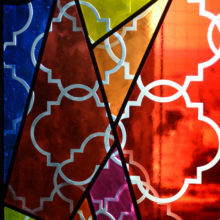 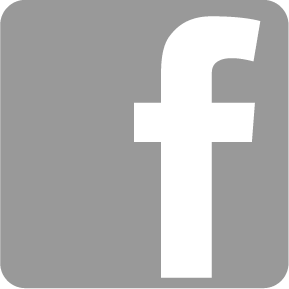 We used them in broad strokes to give a sense of modernity. 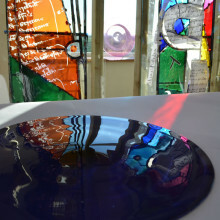 The colours are applied in a symmetrical layout and, in response to our observations of how the light enters the chapel through the day, seek to balance the varying coolness and brightness in the light levels i.e, bluer/cooler northern light in contrast to increasingly warmer and brighter eastern and southern light.